Lincoln Castle is to receive almost £19m for refurbishments, the county council has announced. Planned work includes a new vault to showcase the Magna Carta, repairs to the castle wall and the restoration of two prison buildings. 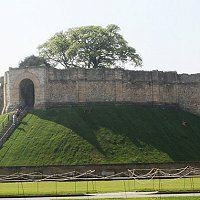 Lincoln Castle was built in 1068 and has housed the Magna Carta since 1215. The new vault will showcase the famous document, one of only a handful of surviving originals.